In mid-June I embarked on a 3-week gluten-free trial. Previously I had asked my endocrinologist whether she thought a gluten-free diet might help with my clustered autoimmune issues. She surprised me by suggesting that I give it a try. Although I began the trial doubting that GF would make a difference in my health, I wholeheartedly committed to following the diet strictly for 3 weeks. One week into the diet I posted an update that I didn’t think it was having any effect on how I felt or the appearance of my inflammatory skin problem. At the end of 3 weeks, my opinion had not changed. I don’t think that my eating plan for those weeks would have been a sustainable diet for the rest of my life. For the most part I followed my normal lowish-carb diet and just avoided bread, crackers, and other no-no foods. My only GF-adapted food was a bread that was edible when toasted and slathered in peanut butter, but disgusting otherwise. I know that there are wonderful GF recipes and foods out there, but I didn’t bother looking for them. I am relieved that gluten-free is not part of my future. Initially it made following a low-carb diet easier because no cheating was allowed. Over the long run it would have been complicated because many wheat substitutes are things like tapioca and rice that are not kind to blood glucose levels. Similarly many healthy substitutes require a lot more interest in planning, chopping, and cooking than I possess. In my opinion the gluten-free world is a continuum with those medically diagnosed with celiac disease on one end and faddists who insist on a gluten-free entree before emptying the bread basket on the other end. In between are people with varying degrees of gluten sensitivity and differing opinions about the value of a gluten-free diet. If you absolutely require GF due to celiac or if you just think it makes you feel better, then go for it. I have no reason to doubt you or judge your decisions. I know a couple of people who definitely feel better avoiding gluten-containing foods and I’m glad they have found something that improves their health. On Monday I was interested to read a blogpost about a gluten-free trial by another person with Type 1 diabetes. Sarah of Coffee & Insulin had not felt well for months and tests for celiac, gastroparesis, and other ailments had come up negative. Responding to Sarah’s frustration at getting no answers, her doctor encouraged her to “Experiment. Only you know how you feel. A patient knows their body far better than a doctor does.” One week into her GF trial, Sarah felt immeasurably better and plans to continue on the diet. Was Sarah’s trial a success and mine a failure? Absolutely not. We both experimented and happened to get different results. I hope that she continues to feel better on a gluten-free diet and I am glad to not add more dietary restrictions to my life. In some ways I think that the biggest win from this whole thing is that both Sarah and I have doctors who were willing to admit that medical science doesn’t have all of the answers and that patient experience and opinions have validity. Sounds like a win-win for patient empowerment. 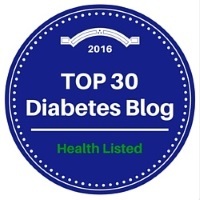 I was introduced to Ann Wallen for the first time in 2012 at a diabetes meet-up in the Minneapolis area. We talked a bit that evening and several more times at other Twin Cities social gatherings. Ann’s plus-one is a white standard poodle named Lily who is a Diabetes Alert Dog (DAD). Asking a few questions, I found out that in addition to using a DAD, Ann is a trainer and consultant for other diabetics looking to add a DAD to their diabetes arsenal. When I saw Ann this spring, I asked if she would be willing to let me interview her for my blog. She readily agreed and in May we met for lunch followed by a walk around Minneapolis-landmark Lake Harriet. I am fascinated by the fact that certain gifted and well-trained dogs are able to reliably alert people with diabetes to highs and lows. Although I am for the most part hypo-unaware and am an avid dog-lover, I don’t believe that I have the need for a DAD nor do I want the work and responsibility of one. My Dexcom G4 Platinum CGMS is incredibly effective in protecting me from severe and debilitating lows. I test enough that I don’t need a dog to tell me that my BG is soaring high and out of range. (More on that later.) Abby the Black Lab is 8-years old and well past the age that it would make sense to train her. Believe me, Abby has never shown the least interest in my blood sugar anyway. But as I said before, I’m fascinated by DAD’s and regularly read My Crazy Life With My Diabetic Service Dog, Tarra’s blog about Duchess, and Black Dogs Rule about the two black labs who keep Stella safe. Ann’s Story: Ann was diagnosed with Type 1 diabetes twenty-six years ago in 1988, a few years after a difficult pregnancy and a 10+ pound baby. She walked into her doctor’s office with the self-diagnosis of Type 1 diabetes. He laughed at her and then reconsidered his hasty opinion after seeing a BG of 650+. In typical Ann-fashion, she refused to go to the hospital and some kind soul at the International Diabetes Center stayed late that evening to teach her how to inject insulin. Years later Ann gradually began losing the warning signals of low blood sugar and by 2004, she was totally hypo-unaware. Rapid and undetected drops in blood sugar increasingly left her incapacitated and afraid to leave home. Like many people who used insulin in the days of animal-based insulins, Ann wonders if pumping with the modern “-log” insulins that lack c-peptide is responsible for her severe hypo-unawareness. There are few diabetes stories where Scott Johnson doesn’t end up in the footnotes and Ann Wallen’s story is no exception. Many years ago Ann read a blogpost by Scott describing the new life gifted to his friend Molly as a result of the daily miracles performed by her diabetes alert dog Dixie. Inspired and excited, Ann contacted Molly to learn more about how dogs could enrich and save the lives of people with Type 1 diabetes. Thus began Ann’s journey into what was then the very small world of diabetes alert dogs. Ann and her business partner Diane have dedicated themselves to training alert dogs in their Scent Angels partnership. The two women have been friends for over 30 years and initially crossed paths through their involvement in horse training. Diane is the principal trainer and trains one dog at a time in her home. She has successfully placed nine DAD’s since 2009. Ann heads the owner training program and consults with people who want to train their own dog to alert. I encourage you to check out the Scent Angels website to learn more about these incredible women and the even more incredible dogs that they have trained. Ann and Diane work hard to be flexible and to evaluate the needs of each individual client. At the same time both women believe that diabetic alert dogs are not the solution for every person with diabetes. You can find contact information for both Diane and Ann on the Scent Angels website. Who should get a DAD? : Voicing strong opinions on this subject, Ann said that diabetic alert dogs should be provided to people who need them, not just those who want them. Each potential client needs to have tried using a continuous glucose monitor (CGM) and found that it either doesn’t work for them or provides inadequate protection. Some good candidates are like Ann with blood glucose that crashes too quickly for a CGM to track. Because only about 30% of these dogs alert at night, a DAD is not a reliable solution to nighttime hypoglycemia. The client must have a job or life situation that allows the dog to be with him/her at all times. Ann believes that children are not good candidates for alert dogs and Scent Angels will not work with children. What is the hardest part of using a DAD? : Ann indicated that dealing with the public is often her biggest headache. She is very open to discussing her dog with others, but does not want others to pet or distract Lily without permission. Ann is extremely knowledgeable about federal law and Minnesota statues regarding service dogs. She is rarely questioned about her right to bring Lily into any establishment in Minnesota. She always carries documentation to support her rights for the rare times that she is challenged and she always researches the service dog statutes for any state that she visits. Some dogs alert to only their owners, but Lily has alerted to others such as Scott Johnson. I normally eat a lowish-carb diet, but splurged with a sandwich and an unfamiliar salad for my lunch with Ann. Interestingly (yes, we might be long-lost twins! ), Ann and I ordered the same meal and independently bolused approximately the same amount. The only difference is that because we were planning to walk after lunch, I programmed part of my insulin as an extended bolus. Halfway through lunch, Lily began pawing Ann with an alert. Ann tested and was well in range at 112. My Dexcom G4 vibrated and displayed a reading of 187 with double arrows up. (I had been in the 90’s before eating.) Obviously Lily was alerting for my high blood sugar. Incredible. Ann has a second dog named Stella who was evaluated and considered too distractible (ditzy!) to be trained as an alert dog. As an owner of labrador retrievers, I have always considered poodles to be foo-foo dogs who prance around The Westminster Dog Show with silly haircuts. Obviously I couldn’t be more wrong. Lily is a standard poodle and of the nine dogs that Diane has trained, three are standard poodles and three are labradoodles (lab/poodle mixes). Researching dog intelligence online, I found that according to Stanley Coren’s book, The Intelligence of Dogs, poodles are ranked #2 in intelligence among dog breeds and labs are #7. Ooops. Sorry for the ill-informed diss, Lily…. There are some people with diabetes who use both an alert dog and a continuous glucose monitoring system. Tarra of My Crazy Life With My Diabetic Service Dog uses both, but does not have much confidence in the CGM. Ann has never had a good experience with a CGM, but I encouraged her to trial the Dexcom G4 Platinum if she ever gets the chance. There is no required certification or license required for a service dog. Anyone can order a service vest online and either legitimately or under pretense have a dog accompany him/her into public venues. There are federal laws that govern the behavior of service animals such as the guidance that a service dog can’t sit in your lap or be on public seating. For those people who legitimately require a service animal, it is frustrating to see others abuse the system. Conclusion: Thank-you, Ann, for giving me the chance to tell your story. Spending time with you, it is easy to see how much Lily enriches your life. Through your work with Scent Angels, you are an inspiration to and an invaluable resource for other people with diabetes. I look forward to spending more time with you in the future both on dog walks and at local diabetes meet-ups.